Welcome to 2019's Day-to-Day weather thread. Thanks 'seabreeze' for your dedication and work on the WZ forum. Much appreciated. An interesting feature for the east quadrant of Australia . It could be described as weak because no Jetstream features? It stalls for 3 days. East coast Australia is on the exit stream of the trough. Here is a snap for Thursday when it first appears on ACCESS g forec ast. Anvils from storms on the ranges spread towards this part of the coast this afternoon/evening. STW was issued for some elevated parts of the MNC earlier today. The ranges and foothills of the MNC are likely to see a few storms tomorrow, with chances becoming increasingly unlikely though the further east across the coastal plain you get. I just managed to crack 1000mm in 2018, with a total of 1012mm for the year. Luckily there were some solid falls in this area in October, otherwise it would have been a very dry year. PAST 24 WEATHER SUMMARY... No significant weather. Expected top of 30 deg c l believe. Low wind making things a little uncomfortable. HAPPY NEW YEAR.. WEATHER WATCHERS. May it be a great but safe one for you all. A Very Happy New Year to Everyone, and thanks to the Stalwarts in the group who keep the interest up, and provide so much meteorological information. And let's not forget the Photographers, they play a large part in the interest with some excellent weather photography. My Annual Rainfall report for NE Toowoomba in 2018 has given us 597.2mm for the year, with 85 days on which rain was recorded. February was the wettest month with 188.7mm, and April the driest month at 6.5mm. During the 6 months from April to September, we only registered 77.2mm in total. Prior to that we lived in Brisbane. I would be interested to see rainfall figures for other parts of Toowoomba, if anyone would like to post them. On the Edge of the Range. what are the chances of some rain in next few weeks? Starting to dry out. Really not much on the horizon for at least the next 10 days. Seems we're in a bit of a groundhog situation right now - endless dry days between 21 and 32 degrees. Some storm activity approaching Tenterfield currently. tracking north and west of the divide currently. We are in the proximity of surface troughing to our west currently. An upper trough forming in the coming days over the eastern quadrant of Australia. The prospect of coral sea surface in-feed courtesy of the west flank of the Tasman high. ACCESS r showing light precipitation signal tomorrow mainly west of the divide. If this evening is any indication then may be more embedded storms west of divide tomorrow. The signal commences at 2pm and weakens about 8pm. Extends north at diurnal max into tea time right up to 25s but west of the divide. The activity weakens when the sun goes down in our neck of the woods . Actually if you are up at 4am tomorrow morning there is an intense band/patch forecast out west of divide between the tweed and Brisbane area.. Happy new year everyone I've spent the past few weeks all over the place from Brisbane to the north coast of NSW and the north island of New Zealand for the last 5 days (where it was way too cold for this QLD'er!!) We finished 2018 with 660mm, like Lani a very dry year overall but with a few wet months (Feb, Oct and Dec) to buck the trend. Heres hoping for a wet 2019! We had over 2500mm at our property just west of maleny for the year. It sits at 550m elevation and seems to get a bit more than the town itself when it's raining. 1532.4mm fell here during 2018, which is 41.6mm above our yearly average. March was the wettest month (475.0mm), and May was the driest (12.4mm). Good old January. Some of our biggest rain events come in January with near max potential for atmospheric moisture. But regular rain is a bit harder to come by. Best of the storm season gone. SE Shower season yet to make a visit. Monsoon trying to get its act together a long way to the north. The ridge thinks we looks lonely so comes over for a visit. 'Let me tell you the story of how I once helped trap an ECL just to your north for 3 days straight to try and cheer you up' it says. PAST 24 WEATHER SUMMARY... Haze. 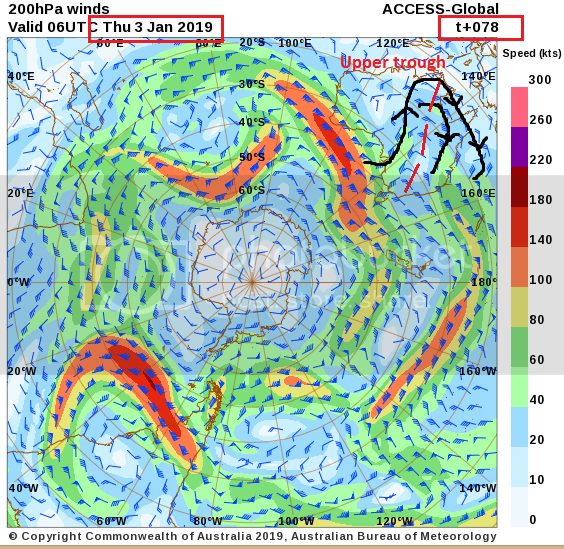 A strong trough line (n/S) from GOC to east VIC, forecast by ACCESS g passing through inland NSW and QLD , 8th Jan.
EX -PENNY making a b line for coastal latitude 17s( ~Cairns) at the same time . Strong ridging keeping her well north. That additional moisture infeed from TS penny and the Coral sea could ramp the storms and rainfall. A tropical dip in isobars for this trough provides adeded interest. Generated in 0.021 seconds in which 0.006 seconds were spent on a total of 13 queries. Zlib compression disabled.